There is a unique connection between people and their rings. This is true whether the ring is purely for the decorative purpose that jewellery serves or whether your ring has the symbolic value like a wedding ring. So popular is the concept of a connection between a ring and your soul that magic rings have been incorporated often in works of folklore and fiction from Norse mythology and Greek legends to the centrality of rings in recent fiction tales of Lord of the Rings and the Green Lantern. Even the beautiful concept of marriage is often symbolized with a ring. Given the importance that is afforded to this particular piece of jewellery, through history, crossing the borders between fact and fiction, across cultures and religions, it should be of no surprise to anyone that various materials have been used to fashion rings. One of the recent trends in rings is rings made from tungsten. In the last few years, tungsten rings have gained increasing popularity especially in regards to men and wedding bands. Tungsten or wolfram as it used to be called is a rare metal found amongst the various bounties of Earth. Once it is mined it is combined under high temperatures with carbon using a binder alloy (usually nickel), to produce a beautiful grayish powder. This powder is pressed and can then be formed into many shapes. Tungsten carbide jewelry or often shortened to tungsten jewellery has revolutionaries the art of jewellery making. This is largely due to the combination of its many desirable properties. 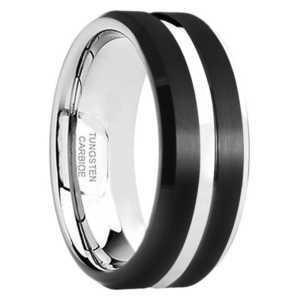 The classic grey/silver color, now expanded to include black and white along with the durability of the metal augmented by its everlasting shine and finally the wide variety of styles make tungsten carbide rings very popular. Tungsten Carbide Rings – Why Are They Better? 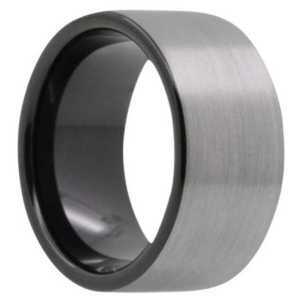 Tungsten carbide rings in many aspects, primarily in the areas of strength, class and style. Tungsten as a substance is extremely hard, ten times harder than gold, and this property leads to a wonderful strength when fashioned into a ring. Tungsten rings will not bend out of shape or distort with time or force as rings made out of other metals might. Tungsten rings are also scratch resistant and daily wear and contact with objects will not leave them any worse for wear. They are known for their gorgeous shine second to none, calling attention to your jewellery. This shine, aided by the benefit of scratch resistance will persist for decades after you buy the ring. While rings made of gold and silver require regular polishing to keep from tarnishing, these rings have no such problem. Even in the battle of tungsten rings vs titanium rings, this property gives the former an edge. A titanium ring will form a blue patina that needs maintenance but a tungsten ring will never require any polishing to restore its original state. The durability of a tungsten ring, as a combination of its resistance to bending, scratching or tarnishing, is much superior to most other metal rings. This durability is ideal for choosing tungsten wedding bands. A wedding band holds much personal and social significance symbolizing a never-diminishing bond, much like rings made from tungsten. Many people face problems with metal allergies leading to health problems and discoloration. High quality tungsten rings using binders like nickel in their production have proven to be hypoallergenic and suitable for many. Tungsten rings tend to be more affordable than many other rings, even the higher quality ones. This is not to say that they look cheap. With their unique shine, colors and styles the elegance of a tungsten ring, at any price, is a foregone conclusion. Tungsten is a heavy metal, and rings made of tungsten tend to be heavier than many other metals, most noticeably titanium. But this is just another benefit of tungsten wedding rings. 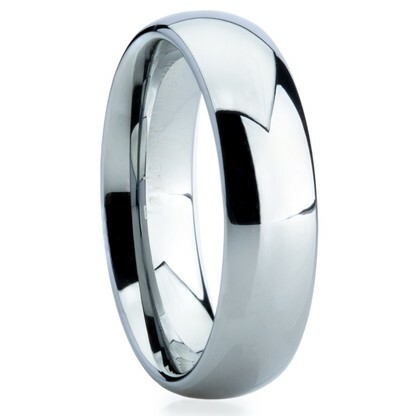 The heavier weight of a wedding band made from tungsten can be seen symbolic of the commitment of marriage. One of the greatest benefits of tungsten rings are the diversity in colors—classic grey, black or white. This makes tungsten rings for men very popular. Grey/Silver: This is the original color of tungsten rings. What makes the grey/silver shine of these rings unique is that it won’t alter over time and the beauty of the metallic sheen won’t diminish after a few years. The ring you see and buy will remain the same in its elegance even after a lifetime. 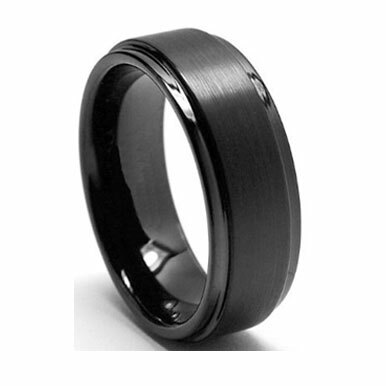 Black: Black tungsten rings are very popular especially with men. Many men want to avoid the flash of gold or silver and this proves to be perfect match. While the durability of the rings stands firm, the process of permanently changing the color to the luxurious black may reduce its resistance to scratches when compared to the grey/silver variety. White: White tungsten carbide, much like black tungsten rings, undergo a process to permanently change the color of the rings from a grey/silver to a rich white color. A white tungsten ring is definitely one of the most elegant styles to grace any finger. 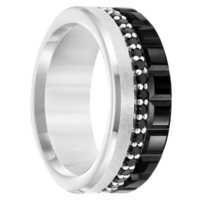 Black and white: The above two types may be combines to produce a beautiful contrast in your ring. This style will instantly set your ring apart. Apart from color, there are yet more ways to pick the ring you prefer. Some styles are traditional, others more alternative. When buying tungsten rings, there is a little something for just about everybody. Classic Domed: This is a style that has been around for decades, and is most common with wedding rings. It is a simple band which is slightly raised towards the center giving it a domed appearance. It is best suited for those looking for a traditional style. Pipe-cut: This is similar to the classic wedding ring but without the domes appearance. It is flat on the finger. This style has become quite popular and is suited to those wanting something a little different but not too far removed from tradition. Faceted Rings: If you are looking for a ring a little outside the box, you should explore this style. 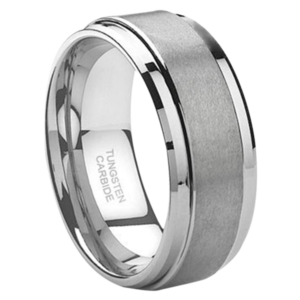 This style of tungsten ring gives a 3-dimensional look to the ring by using techniques like subtle beveling, patterned grooves across the rings or more deep-cut facets giving the ring a modern look. Faceted rings themselves have many different varieties, some only with slight variations of the classic rings and some providing a completely alternative look. Inlay Tungsten Rings: This style allows you to mix it up, by having both tungsten and other metals like gold, silver or platinum in them. A band of other metals, usually running around the center of the tungsten ring can give a beautiful contrast that will increase with time as the two different metals age differently. 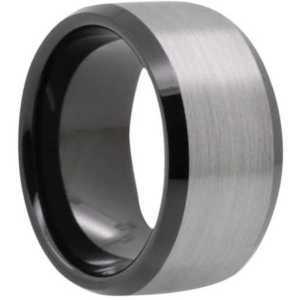 Depending on your perspective, a more ancient or modern idea is the use of wood in inlay tungsten rings. In addition to providing a contrast with the metal, the symbolic value of using wood makes this an interesting choice. Celtic Tungsten Rings: High in popularity now are rings with a Celtic pattern engraved upon them. This is particularly trendy with tungsten rings due to the interplay of traditional Celtic pattern of interconnecting chains and the scratch resistance of tungsten. 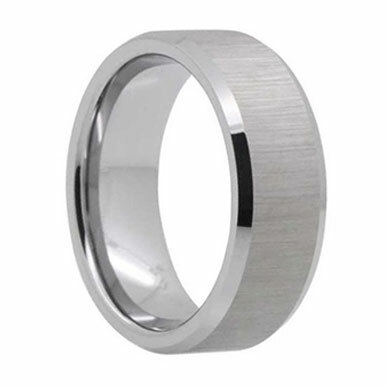 Brushed Tungsten Rings: A brushed finish adds a layer of texture to your ring. 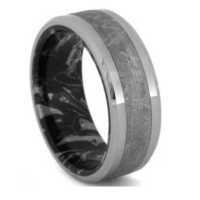 With other materials, this effect may fade but with a tungsten ring, it will endure the test of time. The finish can be of some varieties, the common ones being the satin finish and the matted finish. The two are distinct from each other by the level of fineness in the technique, with the satin ring appearing lighter and softer. Tungsten rings with stones: When looking at tungsten rings with precious gems, diamonds are the obvious choice. They complement the tungsten both in look and shine. Diamonds may be set directly in the tungsten or in an inlay of a different metal. Either way, it is guaranteed to add value and style to your ring. Other precious gems like sapphires, rubies or emeralds can also be found. You can look to create a beautiful effect of contrast using diamonds with black tungsten or a coloured stone with white tungsten. Traditionally, diamonds or precious stones were thought to be the domain of women’s jewellery. But tungsten rings are breaking down this barrier and many men can be seen sporting wedding rings or other rings set with stones. A particular style called the tension set should be approached with caution as only the harder gems can be used safely and for a long period. And if you should choose the tension set style with a tungsten material, it would be best to stick with diamonds. Other variation in rings may include the thickness of ring. Women may prefer a thinner, more delicate band while men may prefer to go with a broader band. However, preferences are not divided along gender lines, and many women may prefer a bold broad band for their tungsten rings as a style statement. Another important style is the type of fit—standard fit and comfort fit. Standard fit rings are flat on the inside surface of the ring as compared to the comfort fit which has a slightly domed surface. This gives comfort rings the advantage as they can be easily removed and are more comfortable to wear for extended periods of time especially for those unaccustomed to wearing rings. Hence, comfort-fit tungsten rings are very well suited to men most of whom do no wear other rings than the wedding band and have larger knuckles than women. The most common misconception about tungsten rings comes from one of their benefits. It is often said, wrongly, that due to its hardness, a tungsten ring is impossible to cut off from a finger in case of an accident or a medical emergency. The myth even goes as far as claiming that in such cases, the entire finger may have to be amputated. In recent years, in light of both its popularity as well efforts by jewelers and medical staff to debunk this myth, it is becoming clearer that it is very much possible to remove a tungsten ring by cutting in case of such an event. In fact because tungsten rings do not bend, in case of an accident like injuring your hand in a car door they may cause less damage. Other metals like gold or silver may distort causing further injury while a tungsten ring is more likely to shatter on impact. Another myth about tungsten rings is also related to their hardness. Many believe a tungsten ring cannot be engraved and engraving a ring is very popular for wedding bands. This too is false, tungsten rings very much can be engraved as is evident by the many varieties offered with engraving. Getting a personalized engraving, like the date of your anniversary, name of your spouse, or anything else is very much possible like with gold or other rings and is offered by a multitude of jewellers. Since tungsten rings are hugely popular with men, many women feel that it is purely a man’s ring. This is again untrue as many women may enjoy the feel of a tungsten ring along with the benefits of its durability. While differences in style between rings for women and men may exist, there exist many styles for women in the category of tungsten rings. The most important point while buying tungsten rings is to be certain of the size. Gold, silver or platinum bands can be resized if they do not fit perfectly. This is not true of tungsten rings. Since they cannot be resized, you must be absolutely sure of your ring size before making a purchase. This does not require you to try out the particular ring you want to buy. Rather due to standardization of ring sizes, you can make a stop at any jeweler and find out the exact size of ring that is comfortable for you. In addition, there are also cut-outs and online tools to help you measure your ring size. Another point of note is the fit of the ring. Be sure that when determining your size, you keep in mind that most tungsten rings are made in a comfort-fit. A related issue to sizing involves the breadth of the ring. A broader ring will provide a more snug fit and a narrower ring will be looser. So if choosing a ring or band of larger breadth, make sure to adjust the size of the ring you purchase. In addition, the breadth of a ring is an important facet of its style and you should make sure that it will look good on your finger. Make sure to keep your general style in mind when picking a ring. Since tungsten rings are popular in many alternative styles, you have to be sure that it will complement you sense of fashion. This is particularly important with a wedding band since you will be wearing that ring every day. If your sense of style is traditional, go with the classic domed or the pipe cut styles for the wedding ring. You can buy a tungsten ring with a modern faceted style for occasional use. The shine of a tungsten ring can be different than other rings and this may not always be evident in pictures. Visit a local jeweler to just look at the ring under different lights before purchasing a ring. It may be preferable to ultimately buy your ring online due to larger variety available but make sure that you are comfortable with the reflective polish. Once you are certain, a tungsten ring will provide with you a lifelong benefit of remaining that way. If you plan to get your ring engraved, be certain of its fit before personalizing it. Once personalized it cannot usually be returned and a tungsten ring cannot be resized. A tungsten ring is made from tungsten carbide and some mixers. Be sure to know all the components of the ring before buying it if you have any allergies of high skin sensitivities. It may be advisable to disfavor tungsten carbide rings containing cobalt which can be of lower quality when compared to additions like nickel. Finally, when buying any piece of jewellery you should be fully aware of all warranties or return policy that is offered. Tungsten rings are very low maintenance when compared to jewellery made of other materials. This means that to keep it looking as bright and shiny as the day you bought it, you require no special polishes and only a few general precautions. While the surface of tungsten rings is scratch-free, due to its hardness it can be a little more brittle than other rings. When struck with a heavy blunt object, it will not bend like other rings but is more prone to shattering. Of course, when you can, avoid hitting not just your tungsten rings but all your jewellery with heavy objects. Sometimes a tungsten ring may break if it falls from a greater height or at an odd angle. The intersecting popularity of internet videos and tungsten rings has resulted in a trend of people intentionally damaging their rings. While the ring may give the illusion of invincibility with its unchanging appearance and bright polish, it is not the Ring of Power, and hitting it with a large hammer will certainly do some sort of damage. Other precautions to keep your ring looking good are the general rules to follow with all jewellery. If you can, take it off at night before sleeping to avoid accumulation of skin oils in the region. It is also advisable to remove your ring if you are working with harsh chemicals or around very abrasive surfaces. This is especially true if you have a ring with an inlay as the metal of the inlay will be far more prone to scratched and corrosion. A huge advantage of a tungsten ring is that it does not require polishing. Just wiping it down with a soft cloth or a quick wash with water and soap will suffice. Fads and trends in fashion and jewellery tend to come and go. But the way tungsten rings have captured the imagination and hearts of people makes it difficult to imagine it as a temporary phenomenon. 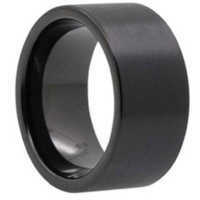 Like the durability of the ring itself, the popularity of the tungsten rings is also likely to stand the test of time. There are several reasons to believe this. The first being the many benefits that a tungsten ring offers over other metals—its shine, its resistance to scratches, its affordability, the low maintenance, but above all its beauty and elegance. A piece of jewellery is akin to a piece of art and tungsten carbide rings certainly do justice to that comparison. Many men and women, who did not like the look of traditional gold and silver jewellery, are turning to tungsten jewellery as a way to express themselves. For men especially, options for rings for a long time have been limited. With the styles and colors that tungsten rings come in, a whole new world of choices has been opened up. It is the perfect choice for wedding rings, with an almost poetic feeling of the enduring nature of both the ring and marriage. Wearing a bold and bright tungsten ring is statement of fashion and style for men and women.